The first time I ever tasted prawns was in Portugal when I was about ten years old. It’s one of my most vivid memories from around that time – I was with my mum, dad and little brother and we were sat on plastic chairs at a beachside restaurant as the tide came in and lapped around our bare feet. I remember thinking they looked like aliens when they came out with their little beady black eyes looking up at me. But with a little encouragement from my seafood-loving dad I was soon unpeeling them with glee and savouring the juicy pink morsels inside. As the sun set over Portugal I realised two things – 1) I loved prawns, 2) one day I would return to Portugal. These cheeky little critters are filter-feeding crustaceans and a pricey must-try in Portugal. On our last night in Lisbon we visited the unpretentious Cervejaria A Berlenga, where the charming waiter chatted away to us in perfect English. Unsure what to expect we ordered a small plate of the barnacles, along with some lightly sparkling Vinho Verde (Portuguese green wine – yum). Although a little green around the edges, and needing a few practise runs to open – the oblong morsels inside were delicious – like a mussel but stronger tasting and with the texture of octopus. 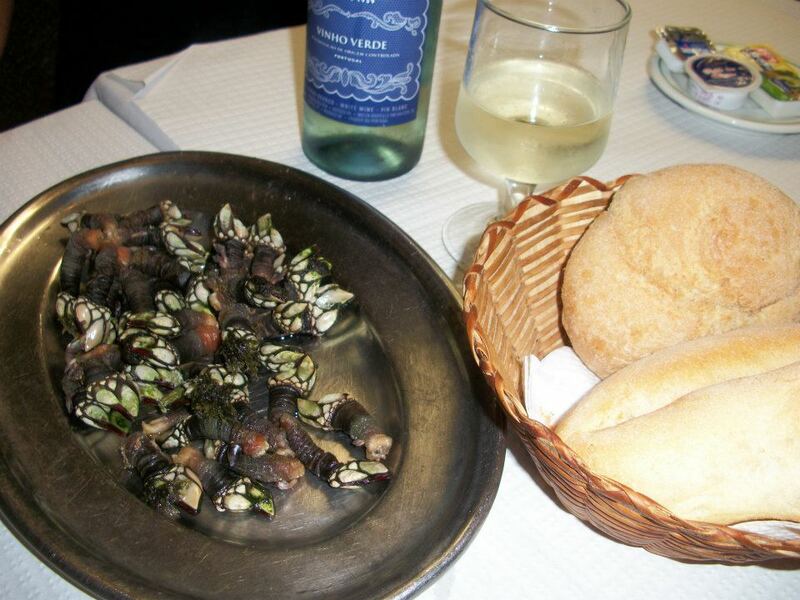 Definitely one of the strangest looking things I’ve ever eaten, and a Portuguese delicacy I’d happily tuck into again!